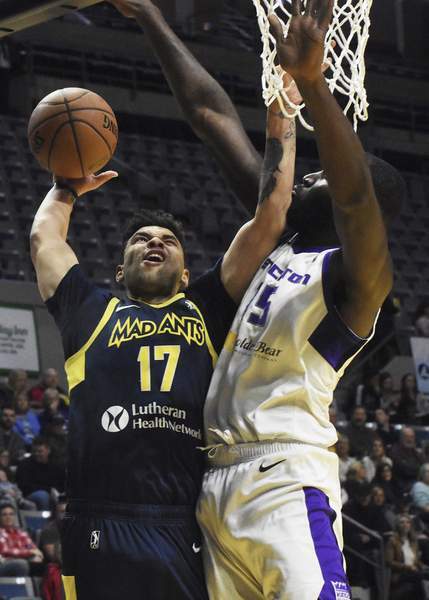 Rachel Von | The Journal Gazette Following a stint with the Indiana Pacers, Stephan Hicks is back with the Mad Ants, averaging 18 points and eight rebounds the past three games. Stephan Hicks may not have gotten on the court during his 10-day stint with the Indiana Pacers – his first time in the NBA – but he sure liked the feeling of being in that uniform. “I got a little taste of it, so I've just got to keep working and I'll be there,” said Hicks, whose Mad Ants face the Capital City Go-Go at 11 a.m. today at Memorial Coliseum. Hicks, who is in his fourth season with Fort Wayne, was signed by the Pacers on Jan. 20. It was similar to what the Pacers did last year with Trey McKinney Jones, rewarding a longtime Mad Ants player for his hard work. But Hicks, who was on the bench for four games with the big club, believes he's destined to return to the Pacers. The Mad Ants' roster was again in flux Wednesday when the team shockingly released Tra-Deon Hollins, who was second in the G League in assists (8.4) and steals (2.6), and was averaging 7.2 points over 30 games. Ike Anigbogu also was called to the Pacers. Mad Ants general manager Brian Levy declined to comment on Hollins but said Fort Wayne doesn't retain his rights. Hicks has upped his game since returning from the Pacers. In three games, two of which were victories, he's averaged 18 points and eight rebounds, bringing his season averages to 16.4 points and 7.0 rebounds in 30 games, while continuing to show he's able to play shooting guard, small forward or power forward for the Central Division-leading Mad Ants (17-15). The season-ending kneeinjury to Oladipo led to the call-up of Edmond Sumner from the Mad Ants. Sumner's departure, coupled with the loss of Hollins, has put more of the onus on Hicks to produce, but he's willing after his NBA experience. Capital City (18-14) has former Pendleton Heights and Butler player Kellen Dunham, who is averaging 6.5 points and shooting 47.4 percent from 3-point range. At 7 p.m. Friday, the Mad Ants play host to the Windy City Bulls, who have former Mad Ants players Walt Lemon Jr. and C.J. Fair, and former New Haven and Notre Dame star V.J. Beachem. Friday will be Indiana Donor Network Night, and the Mad Ants will honor Beachem's former high school teammate Steve McElvene, who died in 2016 from hypertrophic cardiomyopathy while a player at the University of Dayton. McElvene was an organ and tissue donor, making the decision to do so the day before he died.